The Fall Family Bucket List You'll Fall in Love With! | Free Printable! 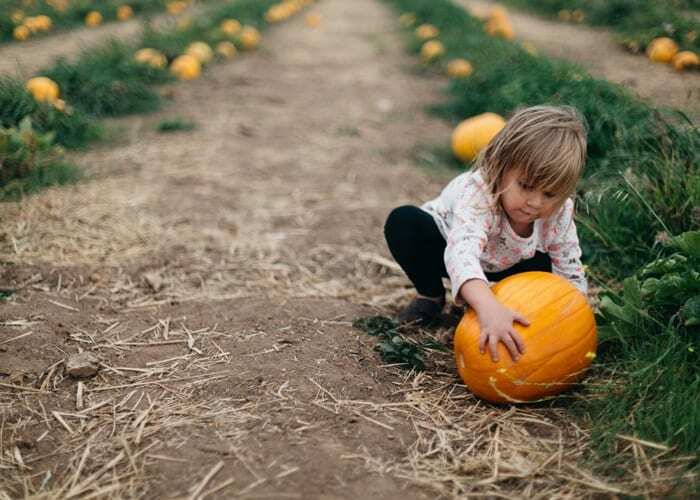 This Fall family bucket list is full of ideas to keep your autumn busy and FUN. Grab this free printable and let the kids cross off each thing as you do it. I love that the internet lights up with fall bucket lists this time of year. People have such great ideas for families to experience the season together. I love soaking up all the sounds and smells and colors of the season and can’t wait to share some of my favorite ideas with you that we plan to do this upcoming season! What are your favorites? Share them with me because I want my family to have the best fall yet. PS Make sure you download my fall bucket list for the kids at the bottom of this post! They can cross them off when they’ve done each activity. Grab your sweaters, those boots you’ve had packed away, and get ready for some magical fun only autumn can deliver. Corn mazes are so much fun! Spending an afternoon wandering around in the crisp autumn air is one of the best things about them. Also, make sure your phone is fully charged! You’re probably going to take a lot of photos. 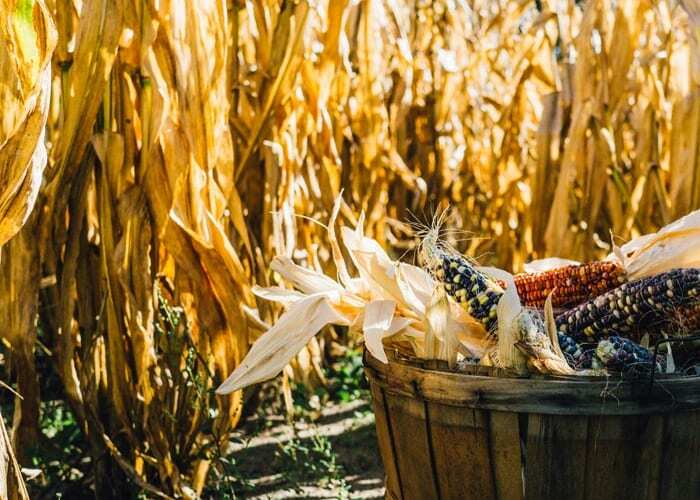 Not sure where to find a corn maze in your area? Corn Mazes America is a directory of all the corn mazes across the country. If you don’t see one that’s near you, call your local Chamber of Commerce or Office of Tourism. Bring cash with you because lots of orchards will also sell cider and apple baked goods. You don’t want to miss out if they don’t take plastic. Ask the folks at the orchard for suggestions as to which trees to hit up. 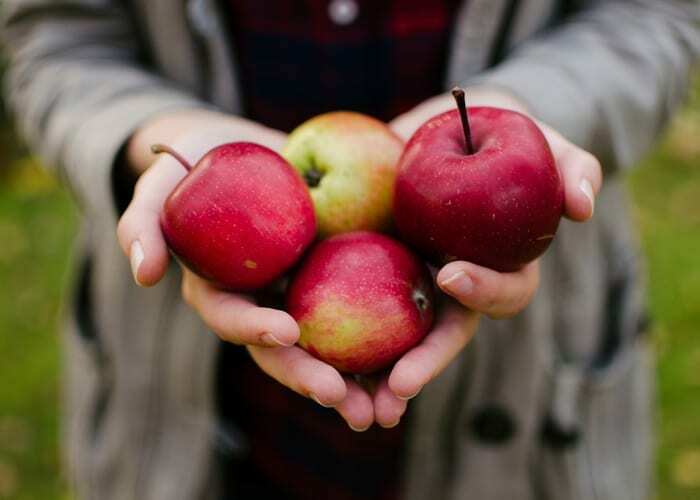 Trees that have a bunch of apples laying on the ground beneath them typically mean that the apples are super ripe. These are good to eat right now, but don’t plan on them keeping a long time at home. An apple is ready to be picked when you can easily pop it off the tree. If it’s hanging on tight, leave it be. When you get home, ask the kids to help you decide what to make with all those beauties. 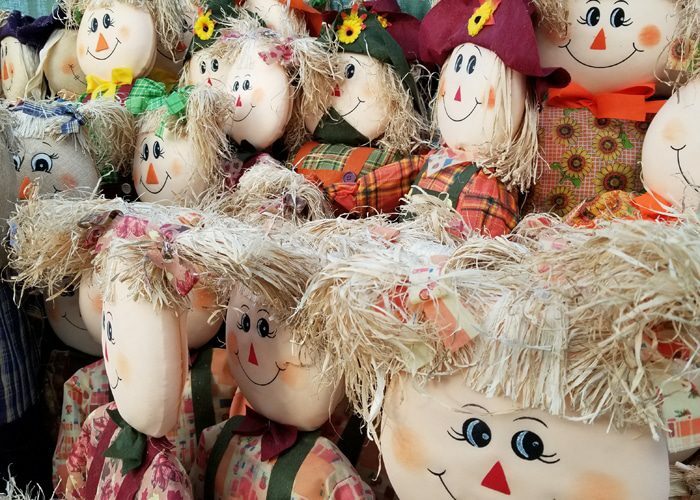 Making a scarecrow can be a bundle of fun! You don’t need to go to the trouble of hanging him on a wooden stake, unless you want to. Make one and sit him on a chair or rocker on your front porch, your lawn, or in your garden. Tie off the bottom of the shirt with twine, and tie the cuffs of the sleeves with twine as well. Stuff the shirt with plenty of hay. You want it to be nicely filled out. Tie off both pant legs. Stuff the pants full as well. To attach the pants to the shirt, tuck the shirt in the waistband and use safety pins to secure them together. Pull the boots on the bottom of the pant legs – because no one wants a scarecrow running around with no feet! You can stuff a pillowcase with straw and to make the head and then draw on the eyes, nose and mouth. Or, using a pumpkin is another great way to give your scarecrow a head. Don’t forget to name your scarecrow! No hay readily available? Use grocery bags or leaves. No old clothes laying around? Hit up your local thrift store for some cheap clothes to dress your scarecrow. Why have just one caramel apple this fall? Let your kiddo invite a couple friends or relatives over and create a caramel apple bar. Bonus points if you use the apples you picked! Hayrides make for such fond memories. Being pulled behind a slow moving tractor while sitting on hay bales and enjoying the crisp weather is a great family outing. The smell, the sounds, everything about it screams autumn. The kids will love it. I’ve found that a lot of pumpkin patches offer hayrides. Call or email the pumpkin patches near you to find out of they have hayrides. Why does food taste so much better when it’s served at a fall festival from a food truck? I don’t know the answer, but I do know that the heavenly funnel cakes are worth the trip! To make it more fun for the kids, be sure to prepare in advance. There are usually porta potties, so take baby wipes and a roll of toilet paper. Keep snacks and juice in your bag and if you have one, a wagon will save the day. Think of the wagon like a parent-powered mini van that only the kids can ride in. Travel + Leisure has a list of the best fall festivals in each state. Your state’s office of tourism will also have more. 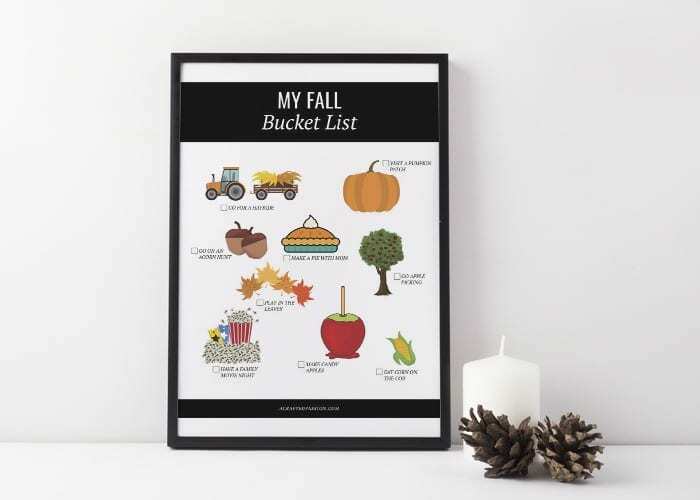 Those are some of the things on my fall family bucket list. What do you and your family do each year to welcome fall? Do your kids look forward to it? This is the year you can teach them to appreciate the season so many of us adore! 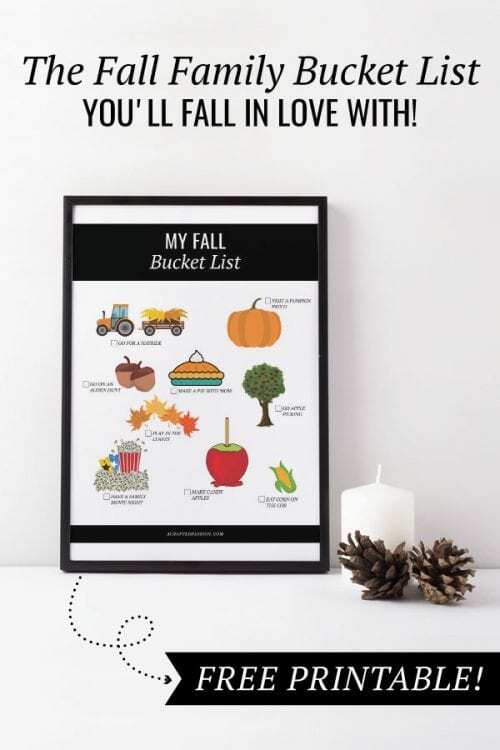 Grab this free printable so your kiddos can mark off their bucket list items as you do them!